So, did you know that September is Missouri Wine Month? OK, it’s also California (like they really need a month), Illinois, and North Carolina wine month too. But I’m focusing on Missouri. 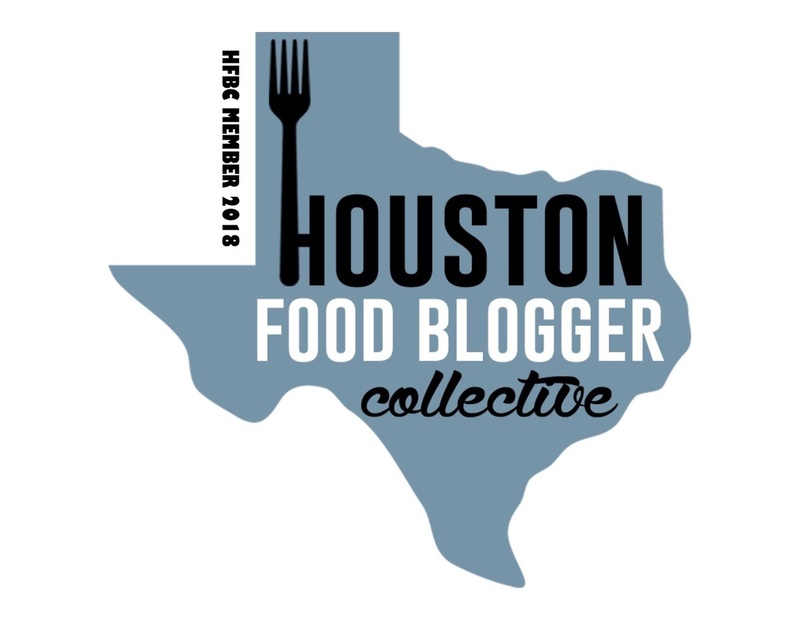 The state celebrates with harvest events, festivals, and special tastings. 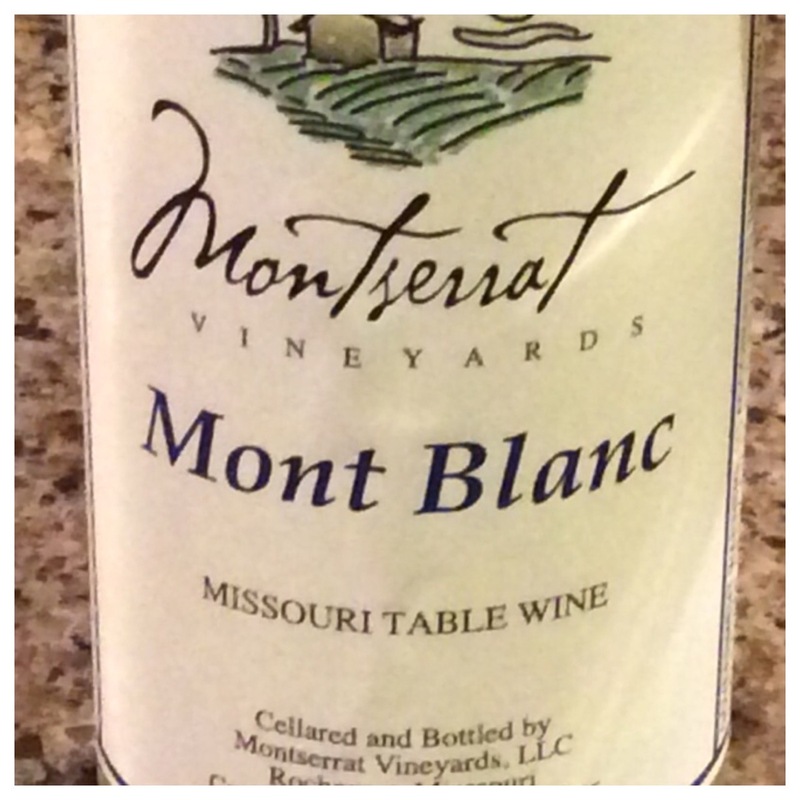 So how lucky that I’d had a recent Missouri wine experience to share. I found myself in Knob Noster, Missouri for a family event. Where is that you ask? Knob Noster is about an hour east of Kansas City, which is where I flew into. Best known for its air force base, Knob Noster is a small, quiet town that also has a really nice, tranquil state park. If you’re in the area, do yourself a favor and take a relaxing stroll through Knob Noster State Park with its series of hiking trails and its winding creek. It’ll be a nice change of pace. Doing my usual research, I found that Missouri has a bit of a thriving wine industry. Who knew?! Well now we both know. German Settlers first planted grapes in Missouri in the 1800s. 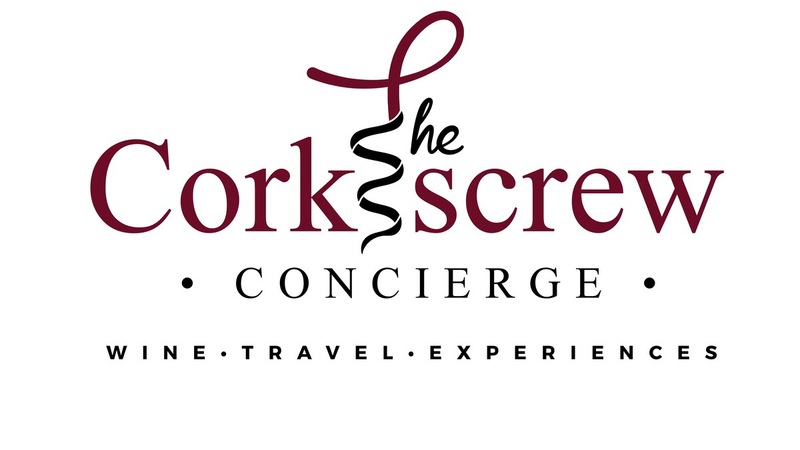 In fact, the state has over 100 wineries represented by several different wine regions. Flying into Kansas City, I found myself driving through the Western Region. 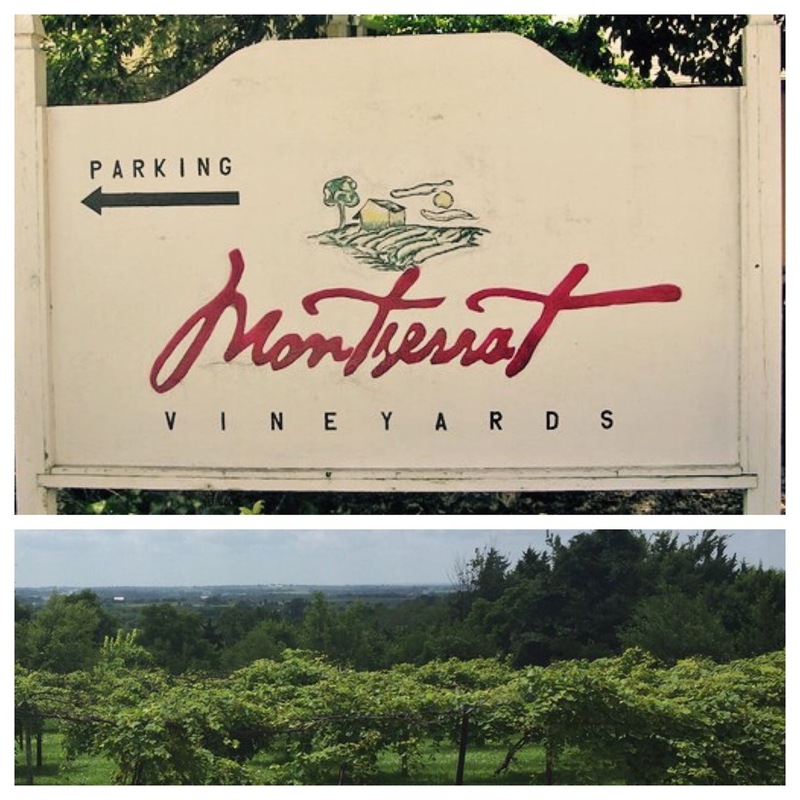 My first stop was to Montserrat Vineyards, just right off Highway 50. When I first drove up, it didn’t seem like much of a place. In fact my companions gave me a hard time because I had to practically beat down the door and open up the place. I exaggerate just a bit. All good though as persistence pays off. Before going inside (and while looking for someone to open up the place) I decided to walk around a bit outside to the back of the building. Definitely glad I decided to poke around! From there you get fantastic panoramic views of lush green fields and lots and lots of vineyards. The winery is situated up on Bristle Ridge and is the highest point in the area so the views really are great. There are a series of decks and seating areas where you can sit and relax and have a glass of wine. Apparently the winery is a popular place to go in the evenings to hang out and in fact, the day I was there, they invited me to come back in the evening to hear some live music. I found myself wishing I’d had more time in the area. Inside was a simple, no frills tasting room with a few cute odds and ends to purchase. But I was there for the wine, right? 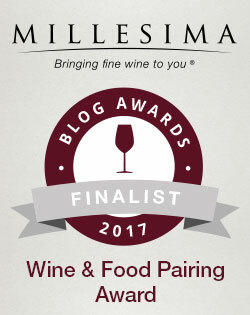 I saddled on up to the tasting bar to see what they had to offer and found that they had 5 wines to taste – 2 whites and 3 reds. One of the things I like about wine tasting (other than the obvious) is discovering new types of grapes. 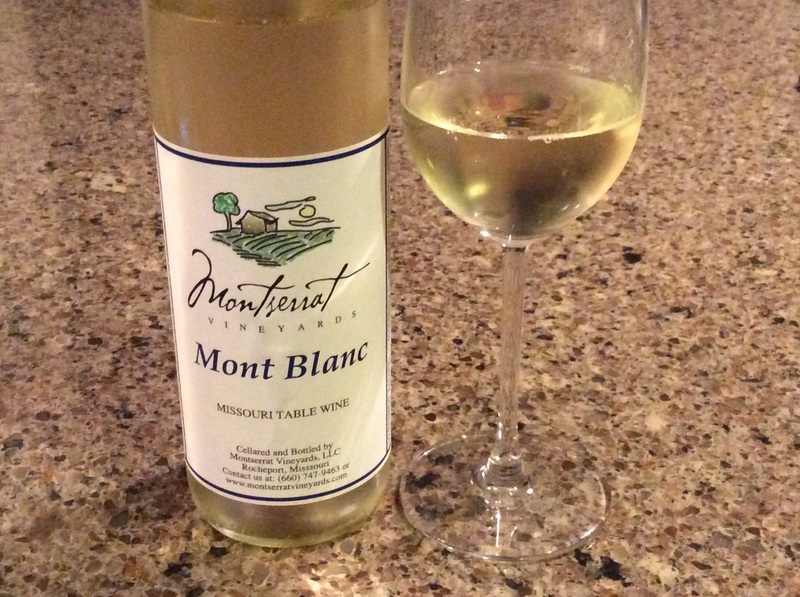 The first wine I tried, called Mont Blanc, was made from the Vignoles grape. I’d never heard of this particular varietal but it was very refreshing and crisp. Definitely something to sit outside and drink on a hot day. Another nice discovery for me was their Norton wine named for the Norton grape variety. This was a full bodied, dry red wine and was a grape that I didn’t know anything about. But after doing some research, I found that it is actually widely planted in the Midwest. It was first planted in Virginia and brought to Missouri in the 1800s where it thrived. In fact, during that time Missouri was the biggest wine producer in the new America. You learn something new everyday! Even today, Norton is considered the official grape of Missouri. Great representation indeed. Going through the other wines, I was able to taste a nice variety of blends. 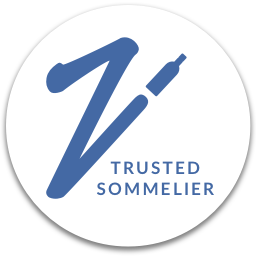 If you lean more towards the off-dry, sweeter wines, they will definitely have something you like. But they also have a couple of nice selections that would be appreciated by the dry wine crowd too. The last wine I tried, Damifino, is apparently their bestselling wine. When I looked at the blend of grapes, the word “Concord” jumped out at me. Yes, this is the same Concord grape that’s in your favorite grape juice! But don’t be dismayed as this was a very nice blend with a hint of sweetness and something I could see myself drinking while sitting around after dinner. If you’re in the area, give it a go. I took of couple of bottles home (remember to always travel with bubble wrap) and can’t wait to open them in the months to come. Running short on time (remember, I was in town for a family event) I dashed in and out of Bristle Ridge Vineyards which was right next door. Like its neighbor Montserrat, Bristle Ridge sits up on a hill (the aptly named Bristle Ridge) offering scenic views of the area. 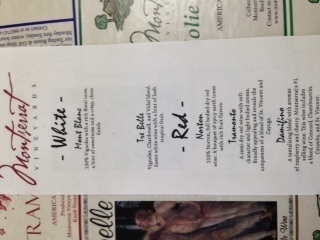 And they have a wide slate of wines to offer. Like Montserrat, they had a light white wine made from the newly discovered (by me) Vignoles grape. But I was really excited that they had a Seyval Blanc wine made from the Seyval grape. I’d discovered this grape on a previous trip up to Quebec. Yes, there is a post about it. Always nice to learn about something and actually have it stick. I just wish my brain recalled what the Quebec wine tasted like as it would have been fun to compare. Oh well. Going through the wines I found that this was definitely a place for the sweeter wine drinker, but the Seyval Blanc and the Burgundy wines they had would please the dry wine drinkers. And guess what? They have a wine made from 100% concord grapes. Definitely a first for me! And they said its one of their best sellers. So while I didn’t get to scratch the surface of what the Missouri wine industry has to offer, I did make a new discovery (at least for me) and I look forward to learning more about the state’s wines the next time I’m in the area. What’s even better is that I had my own bottle of wine to toast Missouri Wine Month. Cheers!